EcoSimplista believes it is possible to live life ‘green’ regardless of one’s income or position in life. It takes a step by step approach to transition to a less selfish, clean, sustainable lifestyle. Each step becomes its own reward. Let us all try to leave this planet, our home, cleaner than we found it for the future of all humanity. As South Florida’s leader and supplier of eco-friendly building supplies and home solutions, the mission of EcoSimplista is quite simple. We believe the use of non-toxic, sustainable products and services will. 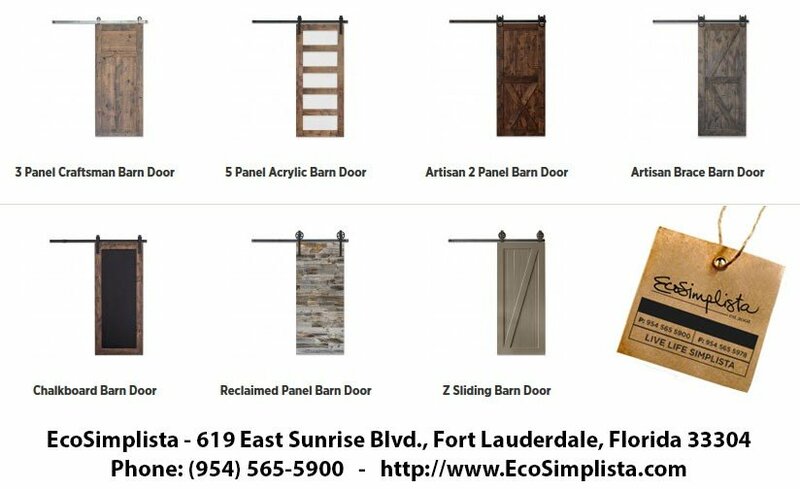 EcoSimplista is you center for selecting Barn Doors for your home or office in South Florida. The Contemporary 5-Panel Glass Barn Door is the ultimate addition to any home. All doors are made from alder wood, and frosted or clear acrylic glass, offering your choice of transparency and modern design. he Artisan 2-Panel door is a variation of the 2-Panel door. The X in the lower half adds a distinct look and rush of rustic into any home decor. The Artisan Brace barn door is divided into two panels. Vertical T&G is strengthening the core and engineered alder rails and stiles strongly holds the door square. The chalkboard center can capture ideas, act as a calendar, or display fun artwork done by the little ones. The barn door is made from hand-selected Engineered Alder Wood for the highest quality and lowest warping or movement by the wood. The Reclaimed Panel Barn Door is made from hand-picked nature-aged lumber. Because of the unique quality of nature-aged wood we do not paint or stain the doors in our shop. 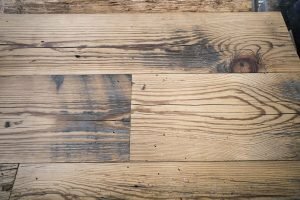 Reclaimed wood is salvaged from old homes, warehouses and historic mills throughout the Southeastern U.S. All the reclaimed wood is hand-milled for reuse in homes, offices, stores, and restaurants. 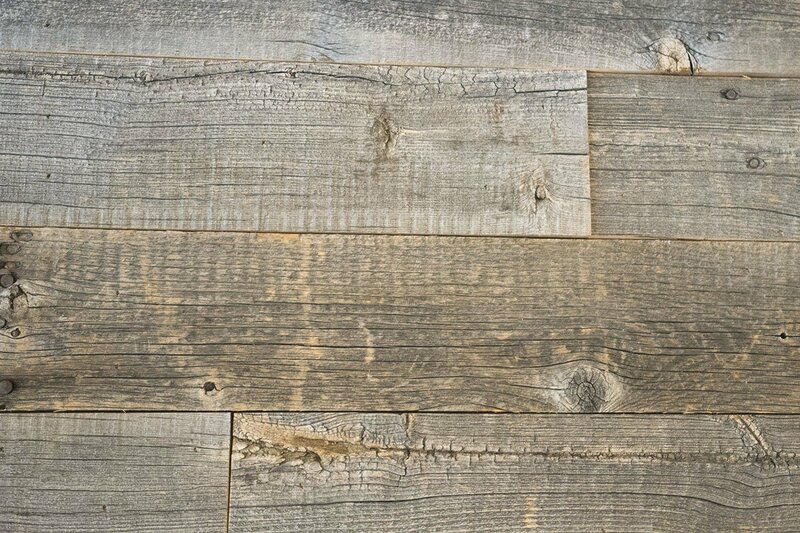 We try to keep a good supply of reclaimed wood on hand and available for pick up, but call first to insure we had not sold out. Each batch of reclaimed wood is unique and varies. Shou Sugi Ban is a type of reclaimed wood that is charred with fire. The fire helps preserve the wood. 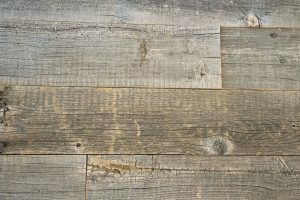 Reclaimed wood is salvaged from old homes, warehouses and historic mills throughout the Southeastern U.S. All the reclaimed wood is hand-milled for reuse in homes, offices, stores, and restaurants. Contact us (954) 565-5900 to find out what he have in stock. As Florida’s leader and supplier of eco-friendly building supplies and home solutions, the mission of Eco Simplista is quite simple. We believe the use of non-toxic, sustainable products and services will update and enhance your home, while bettering our world. For us home design is a combination of functionality, style and endurance, combined with a moral, social and environmental responsibility. 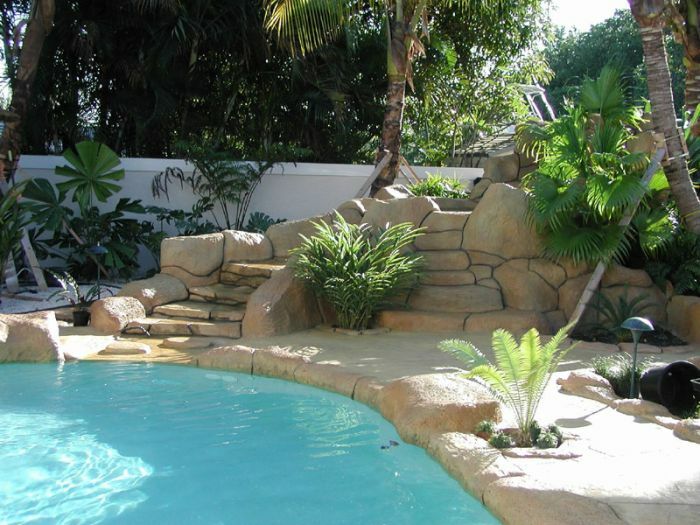 At Eco Simplista design is about creating solutions from natural elements. 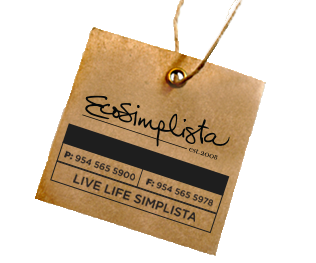 Eco Simplista is here to help you to live, create, and innovate an environmentally responsible lifestyle. Coating pavers versus sealing – our unique, clear, coating process is 3-5x more durable than common sealers. This can be used to protect limestone, sealing of granite, sealing of travertine, sealing of blue stone, sealing protection for stamped concrete. Our coating process can also be applied to the entire surface to seal ceramic tile & grout, seal porcelain tiles. Our coating process is designed to Preserve, Protect and Prolong your asset life cycle by extending the life expectancy of your property, plus contribute to the ease of maintenance of these surfaces, thereby reducing cleaning costs and preserving the surface material. 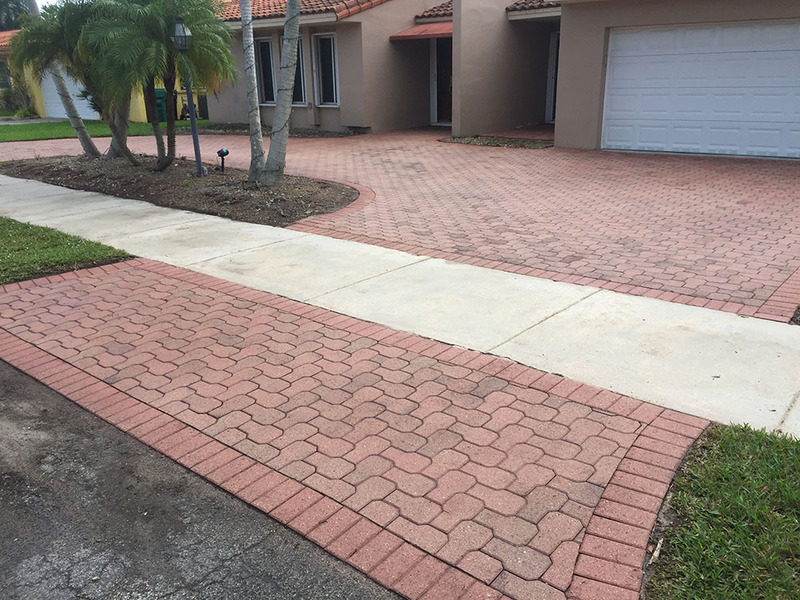 Pavers that are not sealed annually will fade. Typically it only takes 5-7 years before they will show very noticeable signs of lost color. Most people don’t realize this until it’s too late. In the past, the only thing available to restore faded pavers, would be to STAIN the pavers. 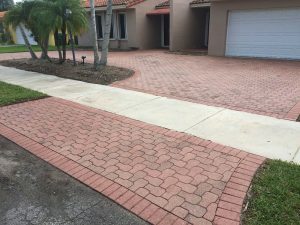 Staining paver amounts to PAINTING pavers. The previous solution of staining pavers results in an un-natural painted look, the surface is slippery, and typically does not last long, especially vehicular pavers as the paint will lift with hot tires. We have to promote our process as ‘staining’, for the search engines. However, our process is a unique paver dyeing process. You’ve seen painted sidewalks that require constant re-painting or re-staining. Staining pavers is the same as painting a sidewalk, which is why we developed our paver dyeing process. 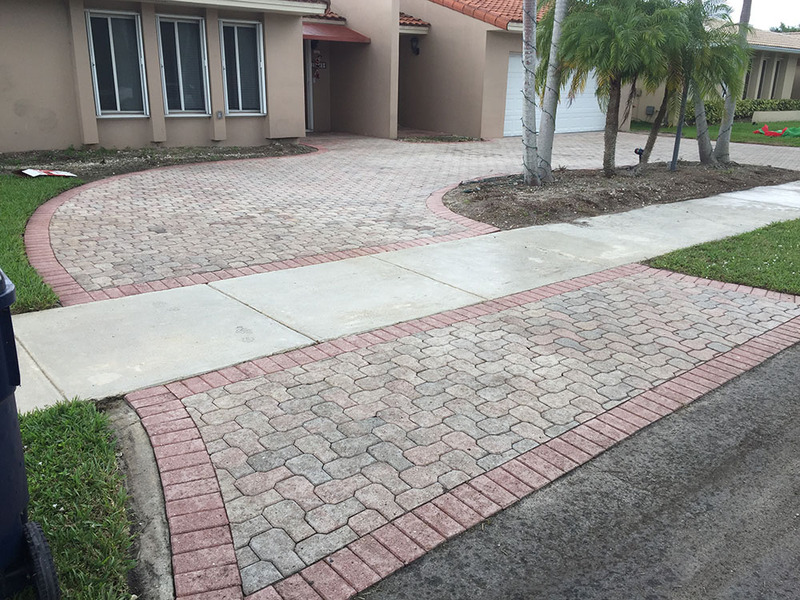 Our process penetrates into the faded paver for long lasting results. Consider having to SEAL pavers every year. 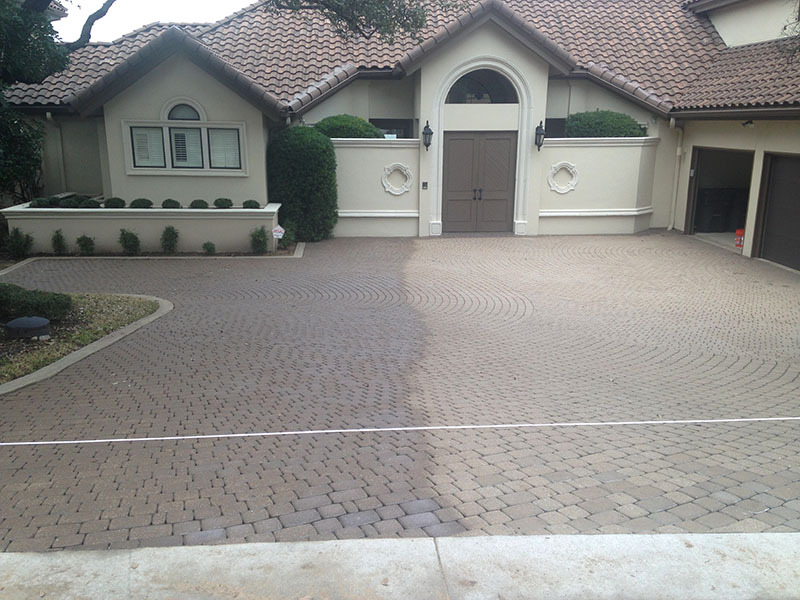 We’re seeing results of 5+ years with our patented paver dyeing process. For this reason, we have developed a DYEING process to restore faded pavers. National Sealing is the largest paver sealing Co in the US and mobilizes across the US and abroad with our patented Paver DYEING Process. 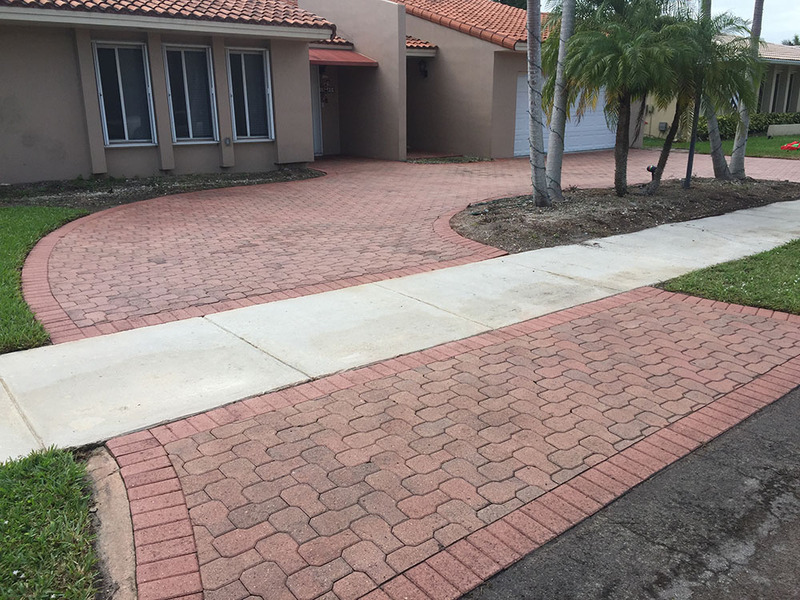 Our process not only restores badly faded pavers to give new life, but also seals and protects from further fading & staining. Contact Us Today to see how we can help you with your paver needs! 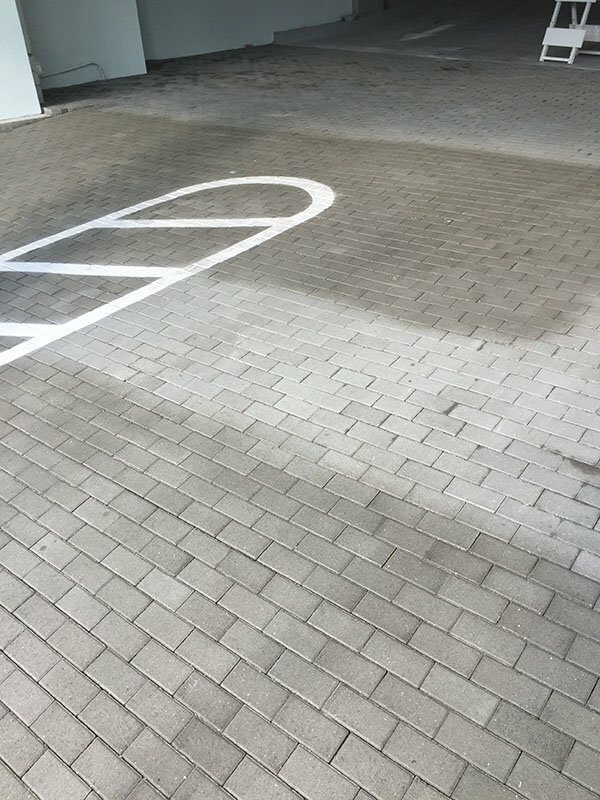 A new hotel in Miami had gray pavers installed. Gray pavers show any type of stain immediately, the dark stains really stand out with the background of gray. Therefore, a durable protection should be applied. National Sealing Co is the largest paver sealer in the US with over 2M square feet of pavers protected. National Sealing Co. was chosen for our durable coating process compared to common paver sealing options. Typical sealers will last 1-1.5 years. We’re seeing results of 3-5 years for our durable multi-component coating. National Sealing Co specializes in durable coatings, cleaning pavers, sealing pavers and non slip applications. We mobilize throughout the US and Internationally. We have had international applications in Sri Lanka, Belize, as well as Barbados. Small jobs are also possible. We package multiple applications in cities all over the US which makes it possible to complete even the smallest application. Inquire to see if we have an upcoming trip to your area. 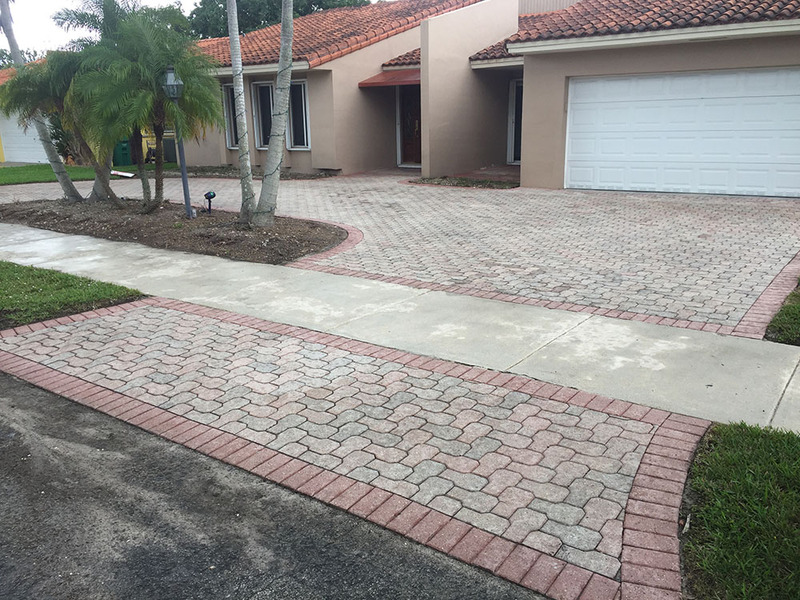 Our product line includes: conventional sealing, anti slip applications, staining pavers, coloring pavers, dyeing pavers and our patented ‘coating’ process. In addition; epoxy coating applications, cement overlays & staining, mildew control, anti graffiti and grinding services. 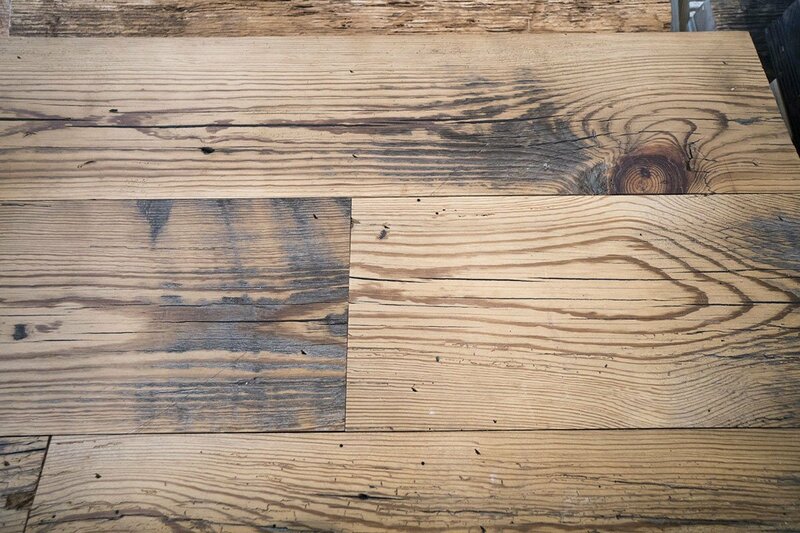 Reclaimed wood is salvaged from old homes, warehouses and historic mills throughout the Southeastern U.S. All the reclaimed wood is hand-milled for reuse in homes, offices, stores, and restaurants. 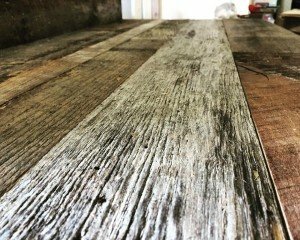 Each batch of reclaimed wood is unique and varies in texture and color. Shou Sugi Ban is a type of reclaimed wood that is charred with fire. The fire helps preserve the wood. Call us at 954-565-5900 to find out if we have other wood not listed! 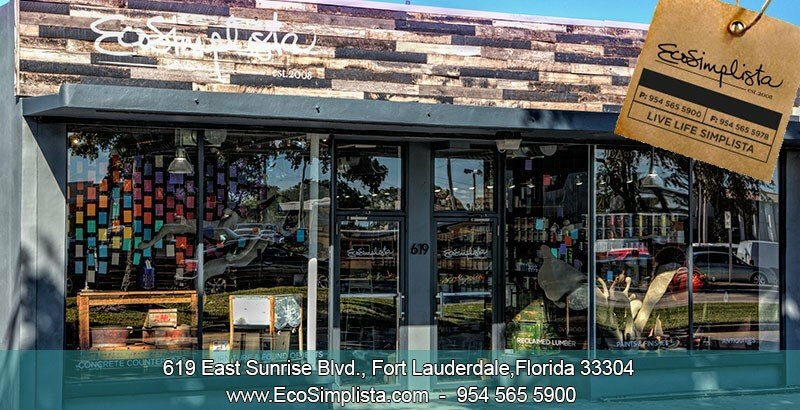 As South Florida’s leader and supplier of eco-friendly building supplies and home solutions, the mission of Eco Simplista is quite simple. We believe the use of non-toxic, sustainable products and services will. Here at Eco Simplista, our sister company Alternative Constructors, we pride ourselves on being a local and family run company. We are grateful to the new opportunities Fort Lauderdale has provided for our eco-friendly company; we are continuing to expand and grow. But each day, as we drive into work, we are exposed to the harsh truth that not everyone in our bustling city is fortunate enough to have a hot meal on their table, let alone a reliable shelter. 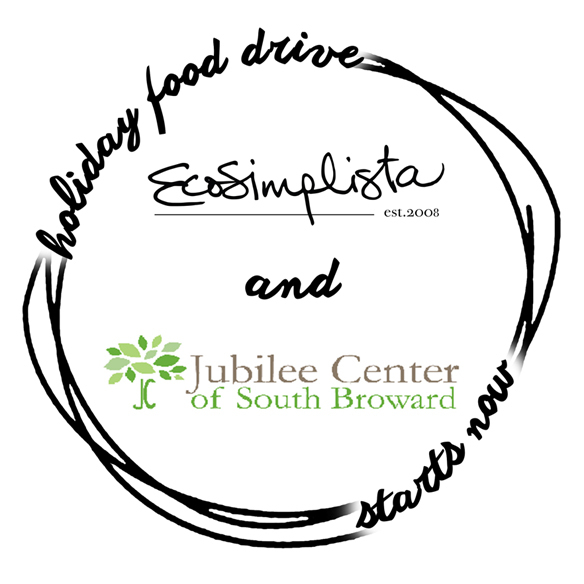 So this year, Eco Simplista, is hosting its first annual food and clothing drive that will benefit an organization dear to Eco Simplista: The Jubilee Center of Broward County. The Jubilee Center is a 501(c)(3) nonprofit agency that has been assisting those in need in South Florida for over 25 years. The Jubilee Center is a soup kitchen, food pantry and social services agency. Every month The Jubilee Center provides over 3,000 life-sustaining meals. In addition to a meal, they provide the homeless with hygiene kits, clothing and walk-around bags of non-perishable food that does not require cooking. The Jubilee Center food pantry likewise provides boxes of food to families in need. The Jubilee Center also assists individuals with getting Medicaid, food stamps, birth certificates, state ID’s and cell phones, as well as legal aid through Broward Legal Aid Society and counseling through Families in Distress. It means a lot to Eco Simplista to give back to the community this holiday season. Please feel free to drop off any donations at the store (619 East Sunrise Boulevard Fort Lauderdale, Florida 33304) Monday – Friday from 8:00am to 6:00pm and Saturdays from 10:00am to 2:00pm. For more information on donations or general questions, call 954-565-5900 or e-mail Contact Form. There’s a conventional way of thinking when it comes to the word sustainable. A few things usually come to mind when I see the word. The first is color: light greens, rich browns, etc. If I were to paint a portrait of what I thought sustainability looked like, I’m sure there’d be a mesh of earth tones and maybe a dancing tree among the foliage. The second is probably health. Which can be tricky because it’s not readily available to the eye. I think we spend a lot of our time labeling products unhealthy by nitpicking all its negative attributes. Which isn’t necessarily a bad thing, it just makes it a challenge to trust a product at face value. And the last, and maybe the most prominent, is lifestyle. With almost every facet of industry pushing towards the sustainable movement, it’s hard to not feel the weight of ‘green living’ thrusting itself into your homes. So how do we take a product’s word for it? Well, that’s a good question. 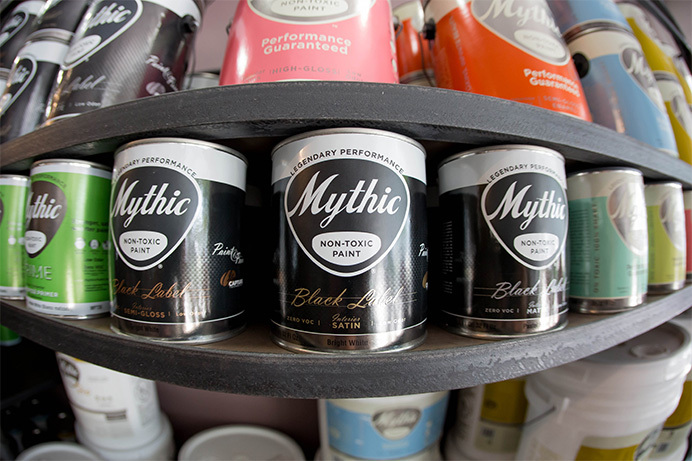 If you were to go to the mythic paint website (mythicpaint.com), the first things to catch your eye are their taglines: “Stronger, safer, smarter paint.” and “ZERO TOXINS. INFINITE BEAUTY.” These are important things to notice because it’s their warm, welcoming handshake. You may have stumbled onto their site entirely unbeknownst. This may be your first stop on a crazed internet search for an eco-friendly paint for your home. Either way, this is how they’ve decided to introduce themselves. And it’s honest. The website itself has a plethora of information on their products having ‘zero volatile organic compounds and carcinogens’ as well as a high resilience to odor. All positive attributes someone looking to paint a home would be interested in. But they don’t want you to just take their word for it, they want you to see it for yourself. They offer a ‘Legendary Performance Guarantee’ that refunds you entirely if you aren’t satisfied with their product. Mythic isn’t so concerned with the idea of being viewed as a sustainable brand because their products do most of the talking. Maybe its poetic irony, but I like the idea of using their earth tones to paint the sustainability portrait I was thinking of earlier. It makes sense to want a healthy product, but what’s safer than a product that cuts to the gist and tells you in bold letters “ZERO TOXINS” the moment they meet you. The sustainability movement started with the idea that we want products that are safe for people, animals, and the Earth itself. And by the look of it, Mythic has been on board all along. 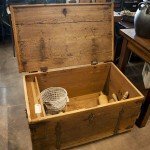 What are some benefits of owning antiques and vintage furniture? We are all aware that the environment is in a dangerous position and that for our planet to exist in the future, we need to change the way we live now. The atmospheric level of carbon dioxide increased 31% between the years 1800 and 2000, and we are watching the environment suffer in a multitude of ways as a result. Everything we do has the ability to affect the environment, and it’s important that we as individuals do what we can to minimize the damage. You can calculate your carbon footprint here to better understand the effect your daily life has on the environment. One great way to go green is to furnish your home with antiques. 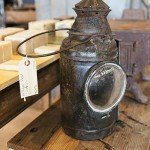 By using antiques, you are giving them a new home and ensuring that they will stay out of a landfill. When garbage is piled in a landfill, bacteria break down the parts that are organic, and methane and carbon dioxide are released into the environment. Even though keeping an antique out of a landfill is only a small difference, each small difference matters. 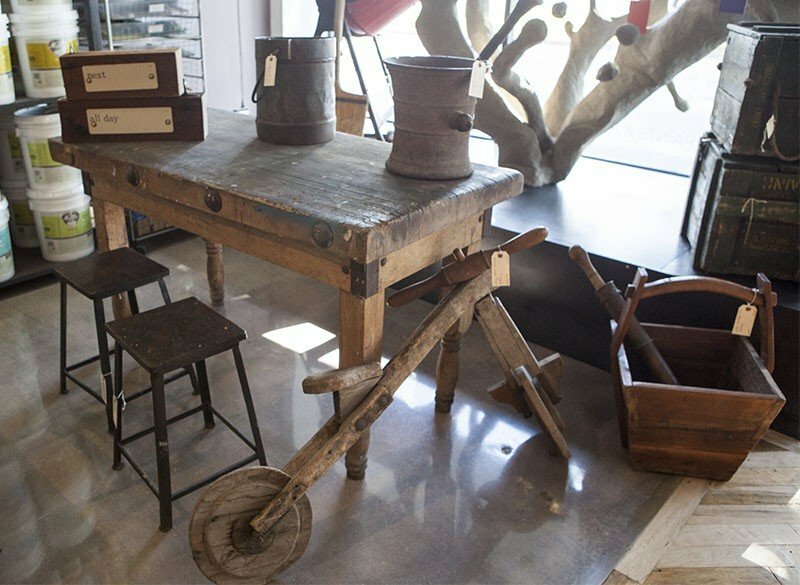 Antiques have a carbon footprint 16 times lower than newly manufactured pieces of furniture, making them a much more environmentally friendly choice. 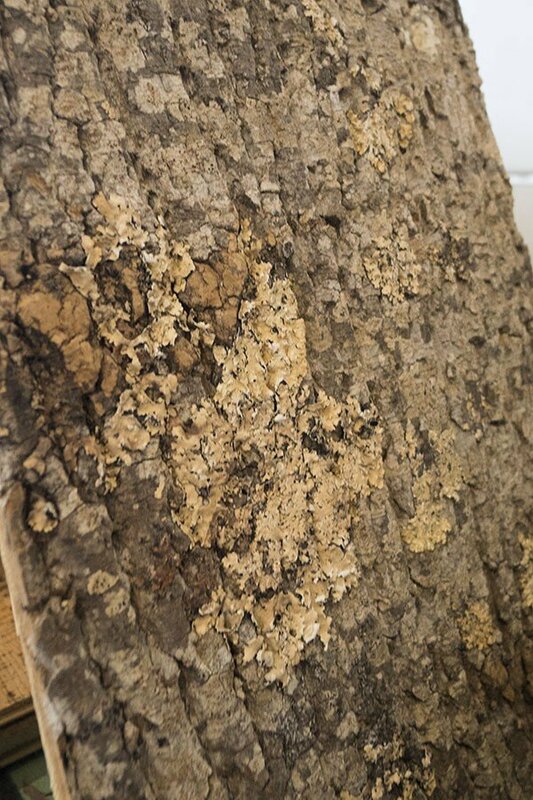 In addition to the environmental benefits of antiques, they are often beautifully made, recalling an intricacy and detail that is difficult to find in modern furniture. Investing in antiques is inviting history into your home, welcoming pieces whose pasts are storied. Even if you find an antique piece that is damaged or has a chipping coat of paint, don’t be discouraged – nearly all antiques can be refinished to have new, fresh life. 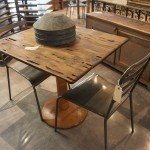 There are many ways to reduce your carbon footprint and help the environment; if you’re looking for furniture, finding antiques is a great step. At Eco Simplista, we are always bringing in antiques. Follow us on Facebook, Instagram, or Twitter to keep up with our new finds. 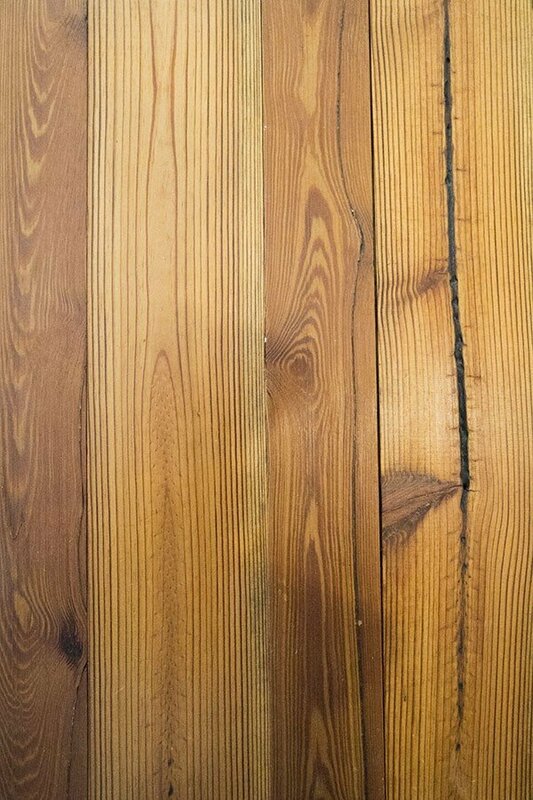 Enhance the natural beauty of any wood surface with this all-natural coating. Whey protein is a natural byproduct of cheese-making it is the main ingredient in this product. 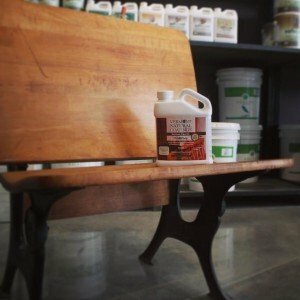 Vermont Natural Coatings PolyWhey Heirloom Wipe-On lets you Finish Like A Pro by producing a durable, safe finish with the look and feel of traditional hand-rubbed finishes. The natural strength of whey protein, a byproduct of cheese-making, is the linchpin ingredient in PolyWhey, a new science in wood finish technology. Use PolyWhey Heirloom Wipe-On on furniture, cabinets, doors or wherever you wish to protect and enhance the beauty of wood with hand rubbed detail. 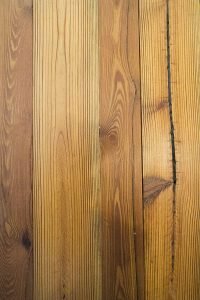 Use on new wood or to restore previously finished wood. Available in a Satin or Gloss finish. 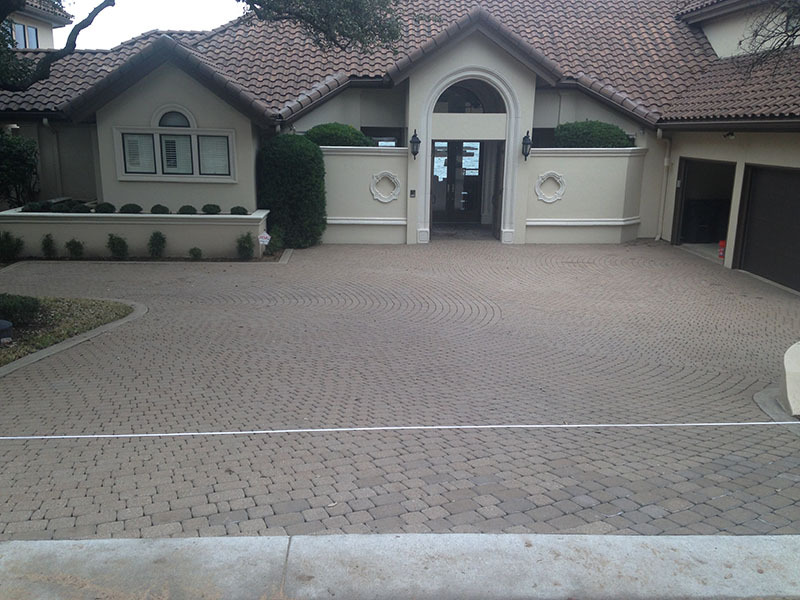 This Texas application had faded brown pavers that needed rejuvenation. National Sealing Co is the largest paver sealer in the country with over 2 million square feet of pavers protected. We recognized a need to develop a coloring process for faded pavers. Fading of pavers is a fatal conclusion to the lack of continued sealing of pavers. The goal was to RESTORE the pavers, or come as close as we could to a natural look. We wanted to avoid the STAINED or PAINTED look which would render an unnatural look, and an ongoing maintenance issue. For vehicular applications staining and painting tend to ‘lift’ with hot tires. Our dye penetrates the porous pavers. For pavers with hues of various colors, the very small molecules in the dye combined with our customized application process will allow the various colors to still show.